It's time for a recap. Feels like I've been running in place a lot lately- busy but not getting much done. But anyway, here's what I've been loving this week. 1. 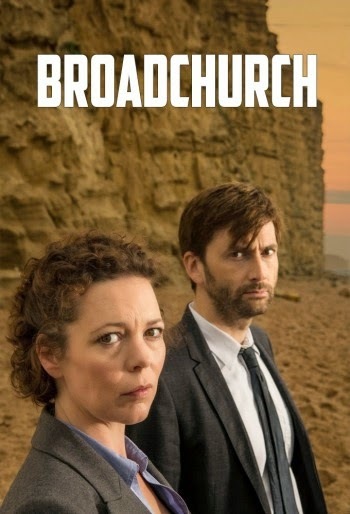 Broadchurch! This is the British tv show that Gracepoint is based on. One of my friends recommended Broadchurch and so I powered through all three DVDs on Netflix and I loved it. David Tennett (of Doctor Who of course) is the lead investigator and Arthur Darvill (Rory from Doctor Who) plays the priest. It's a great mystery, with awesome character development. It's eight episodes long. Gracepoint seems more than "based" on Broadchurch. Many scenes are word for word. Only not as good as the British version. And the lady who plays Kathy Eaton, the newspaper editor- oh my gosh, her voice drove me crazy. But, I'm still willing to tune in to a couple more episodes at least. For starters, David Tennett plays the same lead detective in both series, for another, there's ten episodes in the American version versus eight in the British, so there must be some more material to cover or something. 2. Here's a tip for all you travelers. Google Maps only work if you plug in the correct endpoint. Yesterday was my cousin's wedding, in a town about an hour from here. I was running late and just punched in the name of the church on the little card they send with. We arrived with ten minutes to spare, only to see that no one is there. Hmmm... so I take a closer look. The reception is being held at another church's reception hall. We showed up at that church and not the church having the service. I guess it could have been worse. If there had been a bunch of cars there for another wedding, we probably would have walked right in, sat down, and crashed someone's ceremony. As it was, we went to the local cafe, had some lunch and then waited around for the reception. It was all good, but I was slightly amused with my own incompetence. 3. I found this cool idea on Karamat Sews for a Scrap Jar Challenge. Basically, you fill a jar full of fabric scraps and then if you win the jar, you have to make something out of it, refill it, and then the next winner gets what you made and the jar and the process is repeated. It makes me wishing I had a sewing or quilting guild to do it with. 4. 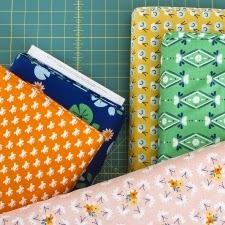 Speaking of fabric- I've been super disciplined about not buying more fabric these past few months, but I finally caved the other day when I was on Massdrop and saw you could get Lotus Pond for $7.50 a yard (two yard minimum) and free shipping! I bought four yards. I think it will come in handy when making Christmas presents this year. 5. And finally! Today is the day we head back up to Michigan's Upper Peninsula. I think the leaves are at there peak and it should be a very pretty drive. Temps are projected to be mid 40s to low 50s, but feeling about ten degrees cooler due to wind and clouds. But I'm still super excited about it. Oh, I like that scrap jar concept! What a great way to have the scraps organized and set aside, as well as acting as scrap-clearing inspiration. If I ever get back to sewing, I'll have to do that!